The word "spirit" is used in several different ways in the Bible. The Old Testament (Hebrew) word for "spirit" is ruah (pronounced roo-akh); the New Testament (Greek) word is pneuma (similar to the word pneumonia, in which the "p" is not pronounced). In a number of passages the word "spirit" means "wind" (see Genesis 8:1; Numbers 11:31). Very often this word is used of the Holy Spirit (Genesis 1:2; Matthew 1:18--where "Ghost"="Spirit"). In John 3:8 the same word (pneuma) is used for both "wind" and the Holy "Spirit": "The ____________ (pneuma) blows where it wills (pleases)...so is everyone that is born of the _______________ (pneuma)." You cannot see the wind, but you can see and feel the effects of the wind (the sailboat being pushed across the lake, a flag blowing in the breeze, leaves swirling in the air, etc.). Likewise, when a person is born again, you cannot see the Holy Spirit in his or her life, but what can you see (Galatians 5:22-23)? 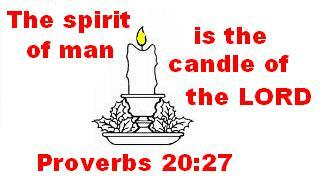 ______________________________________ The word "spirit" is also used of evil spirits or demons (Matthew 12:43,45). According to Proverbs 16:32, it is easier to take (capture and control) a city than to do what? _________________________________________________ Man has great difficulty conquering and controlling his passions, his affections, his feelings, his desires and his temper. The taking of a city is child's play compared with the ruling of one's spirit. [The next time your parents forbid you to do something or to go somewhere, see how easy it is to keep your emotions in check!] The person who does not rule his own spirit leaves himself wide open for attack (Proverbs 25:28). Anyone who attacks him (by irritating him or by provoking him or tormenting him) SUCCEEDS! The only person who can really control his own spirit is the one who allows his life to be filled and controlled by the Holy Spirit (Ephesians 5:18). The fruit of the spirit includes temperance or self control (Galatians 5:23). "His (Pharaoh's) _______________ was troubled" (Genesis 41:8). "God hardened his (Gihon, King of Heshbon's) ____________" (Deut. 2:30). Ezekiel 13:3 speaks of false prophets who follow their own spirit. "For what man knows the things of a man save the _____________ of man which is in him" (1 Cor. 2:11). "The body without the _______________ is dead" (James 2:26). Even though the Bible speaks of unsaved men having a spirit, yet the spirit which they have is not functioning the way it was meant to. Adam was created body, soul and spirit. God created the body to house the soul and the spirit. He created the soul for mankind to identify with human life and other life forms. The spirit was designed to identify with God in worship: "God is S___________, and those who worship Him must worship in ____________ and in truth" (John 4:24). In the Fall, Adam's spirit was separated from God (spiritual death) and it remains separated from God in all of his descendants. Man's spirit therefore is dead to God, and its original intent is thwarted by spiritual death. How then do we explain the Scriptures (quoted above) which speak of an unsaved person's spirit? Quite simply: though man's spirit is dead to God, it is very much alive to the things of man. It fell to the level of man: hence the expression in 1 Corinthians 2:11, "What man knows the things of a man, save the spirit of man which is in him?" Though man has a spirit, it is dead toward God. It only relates to the things of man. The Bible declares that the unsaved person is "DEAD (spiritually dead and LIFELESS) in __________________ and __________" (Ephesians 2:1). The spirit of an unsaved man is aware and knows about the things of man (man's thoughts and interests and activities) but he is totally insensitive and blind when it comes to the things of God (God's thoughts and ways and works)--see 1 Corinthians 2:11,14,16 and Isaiah 55:8-9. The Bible gives an illustration of the spirit of man. It is found in Proverbs 20:27. The spirit is that part of man that was meant to fellowship with God and enjoy God. The unsaved man is dead to the things of God and unable to relate to God in a real and right way. He is like an unlit candle. When a person is saved it is as if God lights the candle and the person becomes spiritually alive and able to fellowship with His Creator in a personal way. Or, to use an electrical illustration, the unsaved person is like an appliance that is not plugged in. It is only when the appliance is plugged in that it can function in the way that it was made to function. Man was made to function in a spiritual way, in a way that brings him in close contact with God, to enjoy God's Person and Presence. The only way a person can get "plugged in" is by coming to know the Lord Jesus Christ as personal Saviour. Another illustration is that of AM and FM radio. The unsaved man (the Adam Man) is spiritually dead and can only tune in to AM. He cannot connect to a higher frequency. The saved man (the Forgiven Man) can tune in to both AM and FM, and his spirit is able to connect with God and commune and communicate with Him. When a person is truly saved, he is QUICKENED or MADE ALIVE by God (Ephesians 2:1,5) and he receives the Holy Spirit (1 Corinthians 2:12) who is able to influence man's spirit so that the saved man can perceive and understand and grasp the things of God. A saved man's spirit is able to be alive to the things of God (spiritual things), because the candle is lit (the cord plugged in). Through his spirit man reaches up to the spiritual world in a Godward direction. Through his spirit man is able to seek God and meet God and communicate with God and do business with God. Martin Luther once said, "The spirit is the highest and noblest part of man, which qualifies him to lay hold of incomprehensible, invisible, eternal things; in short, it is the house where Faith and God's Word are at home." In Matthew 26:41 Jesus told His disciples to "watch (stay awake) and ____________." Was their flesh (body) willing to do this? _______ Was their spirit willing to do this? _______ The spirit is that part of man which is able to contact and commune with the living God. Man is thus able to enjoy a wonderful living and vital relationship with the Heavenly Father and with His Son, the Lord Jesus Christ. Another important passage concerning the human spirit is found in Romans 8:16: "The Spirit (the Holy Spirit) Himself beareth witness with our ____________ that we are the __________________ of God." How do I know that I am a child of God and that I am really saved? This verse says that there are two witnesses that tell me that I am a child of God. The first witness is my human spirit--that part of me which is sensitive to God and sensitive to spiritual things. My spirit says, "Yes, I am a child of God. I'm saved and I can now pray to God and know that He's my Father. I now have a wonderful personal relationship with Him!" (see Romans 8:15). The second witness is the Holy Spirit which I received the moment I was saved (see Romans 8:9,15). The saved person can say, "I know I'm a child of God. I am His and He is mine!" The Spirit of God then bears witness with our spirit and says, "Amen, and I am in you as proof that you belong to God." According to Deuteronomy 19:15 two witnesses are enough to settle a matter. Thus, the human spirit and the Holy Spirit stand up to give their testimony. The human spirit says, "I'm a child of God, ABBA FATHER!" The Holy Spirit says, "Yes, he's a child of God, ABBA FATHER!" That settles it! The Holy Spirit has a very important ministry of CONVINCING men. He once convinced me that I was a sinner. He now convinces me that I'm a saint (a saved person, a child of God)! Has God quickened you and made you alive in Christ? Are you sensitive to the things of God? Is your candle lit? Are you plugged in to God? Are you able to freely and naturally pray to the Lord and talk to Him and sing to Him and worship Him or are these things merely a ritual (doing something mechanically, merely going through the motions without any life or reality behind it)? Are you convinced that you are a child of God? Do you have assurance of your salvation? Are you able to say, "I'm sure that I am saved!" Does your life show that you are saved? Are others sure that you are saved? Can others see the evidence and the effects of the Holy Spirit in your life (John 3:6-8)? You need to KNOW that you are saved and you need to SHOW that you are saved. _____ God does not seem real to me. _____ I'm not sure if I really have such a relationship. If you would like to know the Lord Jesus Christ as your personal Saviour, please be sure to talk to your Pastor, your Sunday School teacher or some other Christian who can help you. Nothing is more important than having a right relationship with the God who created you! See John 17:3. May God help each of us to be SPIRITUAL men and women (1 Corinthians 2:15 and Galatians 5:22-23; 6:1)!